There are many ways to care for your dog. While most dog owners know the basic steps to keeping their dog healthy and happy, there are some other parts of pet ownership that people tend to forget. For example, many owners forget to bathe their dogs as regularly as they should. Bathing your dog has many advantages, both for you and your dog. Today, we will be going over the reasons why you should bathe your dog, and we will also be giving some advice regarding how you should bathe your dog. There are many things to consider when bathing your dog, so let's get right into it. It is important to get your dog accustomed to bathing and water from an early age. The reason that most older dogs tend to be uncomfortable when it comes to bathing is that they were never exposed to it from a young age. If your dog is bathed regularly from when it is a puppy, it will be far more at ease with bathing when it gets older. This is an important precedent to set as it will be very difficult to get your dog to go along with being bathed if it is not accustomed to the process. It may even be impossible to accomplish at home without risk of your dog getting angry and reacting harshly. This may lead to you needing professional help when it comes to bathing your dog. If you want to avoid possibly wasting money and making it harder for yourself to look after your dog's needs, it would be a wise choice to get your dog used to bathe starting early on. Depending on your dog, you may still be able to get them accustomed to dog baths or dog showers at an older age, it all hinges on their feelings towards the water. The most obvious reason behind why you should bathe your dog is also the most important one. If you properly bathe your dog often enough, you will find that it will have a much better quality of life than otherwise. Having dirt and countless other things tangled in their fur is one of the main detractors to dogs’ health. Clean fur ensures that your dog will have less trouble when it comes to possible health risks such as ticks or other parasites. You would be surprised by how much of an effect clean fur can have on your dog’s health. Beyond diminishing the chance of ticks, it will also greatly diminish your dog’s chance of disease, as there will be no opportunity for bacteria and fungi to grow in its fur. Keep in mind that your dog’s cleanliness is not solely a health matter. Other than health, the cleanliness of your dog’s fur will also affect its happiness. Think about it from a dog’s perspective: would you prefer to walk around with your hair full or dirt and garbage or would you feel better about having clean, healthy hair? It is important to ensure that you can keep your dog as happy as possible because they would certainly return the favor for you. A happy dog is more often than not a healthy dog. 1. Have your dog stand somewhere that you can get wet, such as in the tub or the back yard. 2. 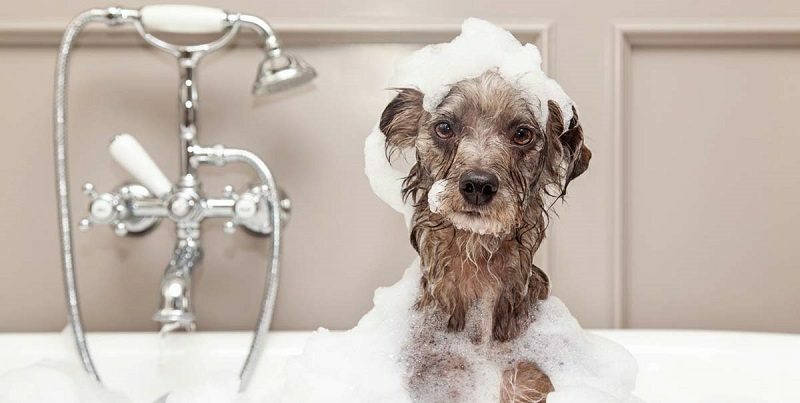 Use either a hose or the shower to wet your dog with warm water (not too hot and not too cold). As you can see, bathing a dog is not a complicated process. As for how to bathe a puppy, it is the same process, but you must take care to be more delicate when you handle a puppy due to their smaller size and their developing bodies. When it comes to how often your dog should be bathed, there are a few things to take into consideration. The first thing is the strength of the dog shampoo you are using. If you are using medical dog shampoo, or another form of dog shampoo that is stronger than normal, you will want to limit the number of times you bathe your dog. When you overuse extra-strength shampoos, your ﻿dog’s skin starts to dry out, and this can negatively affect not only their skin, but dogs’ overall health. It is recommended that you do not use these types of shampoos more often than is advised on the bottle. If you are using a typical over the counter dog shampoo, you should bathe your dog when you see that their fur is starting to get a bit more dirty than usual. We would recommend not bathing your dog more often than once a week. Bathing your dog once a week is often enough to ensure that they are almost never dirty, and anything more common than this is simply overkill unless your dog tends to play in the mud almost daily. We hope that this article has helped you understand some of the benefits to bathing your dog. 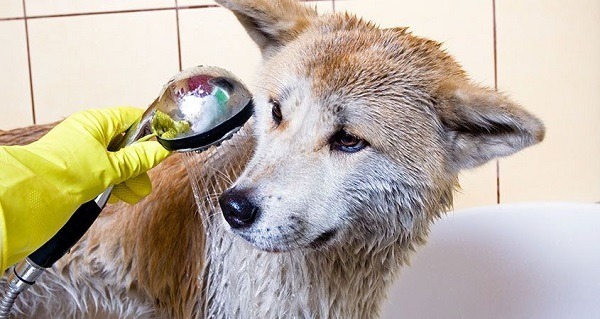 While it is important to ensure that your dog is clean and healthy, you will also want to make sure that you are not bathing your dog too often, as this can also be a problem.